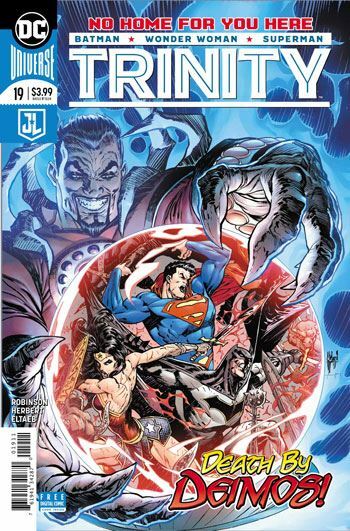 James Robinson continues with the Skartaris storyline in the latest issue of Trinity, joined by Jack Herbert on the art. 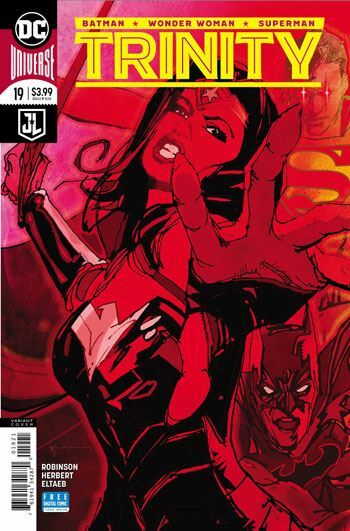 A book like Trinity, which features the big three DC heroes, has a very difficult path to tread. The stories will not, by the very nature of the book, usually tie directly to the major events taking place in the books of the main characters. That means that each storyline has to make itself an event, something so special that the title is worth picking up. Bravo, Mr Robinson, you succeeded at this task! While the first part of the story was a big set-up, and the second more of a tease, with elements and minor characters from the old Warlord series being used, this third issue dives whole heartedly into the Lost World. There are more than a few twists and turns along the way, a great entrance from an unexpected character, and a strong ending. Seriously, what more could one want? Without spoiling anything, one of the best features of this issue is that Superman, Batman, and Wonder Woman, despite their vast power and status, are really nothing more than pawns when it comes to Skartaris. They are very much outsiders, and very much out of their depth. To me, that makes the story all the more worthwhile. It’s so common to have these heroes totally in control of the situation around them, even when facing their big enemies. Here, they are essentially foot soldiers in a conflict totally out of their control. Yes, if one is familiar with Warlord this issue will hold more resonance, but even without that, this is a great rollicking adventure.